Looking to for some laughs these spring school holidays? 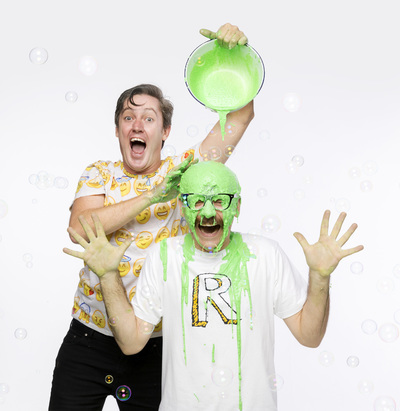 Australia’s favourite kidult comedians, The Listies, have packed up their toilet paper guns and inflatable snot monster and are bringing Ickypedia to the Hawthorn Arts Centre on Friday 28 September. Matthew Kelly and Richard Higgins aka The Listies are a Melbourne Comedy Festival award-winning pair who have performed kidult comedy shows for over a decade. Ickypedia is their newest stage show, which premiered at the Arts Centre Melbourne in July last year. Get yourselves to Hawthorn Arts Centre on Friday 28 September and you'll be LOLing with The Listies as they entertain you with their Ickypedia antics! We're delighted to offer a Family Pass for one KidTown Melbourne reader to see Ickypedia at Hawthorn Arts Centre. Tickets are valued at $25pp so $100 for the Family Pass. To enter, like this post on Facebook, and tell us why you would like to win in the comments. Feel free to tag your friends for more entries! Don't forget to like our page otherwise we can't tag you if you win. Comp ends Wednesday 26 September at 5pm AEST and the winner will be contacted via Facebook. For more information and to book tickets to see Ickypedia at Hawthorn Arts Centre click Here.